Kölner Classic Poliment - Black | Polishing Pastes & Gilding Boles | Gold & Gilding Materials | Kremer Pigments Inc.
P280a: Wear protective gloves/ clothing. 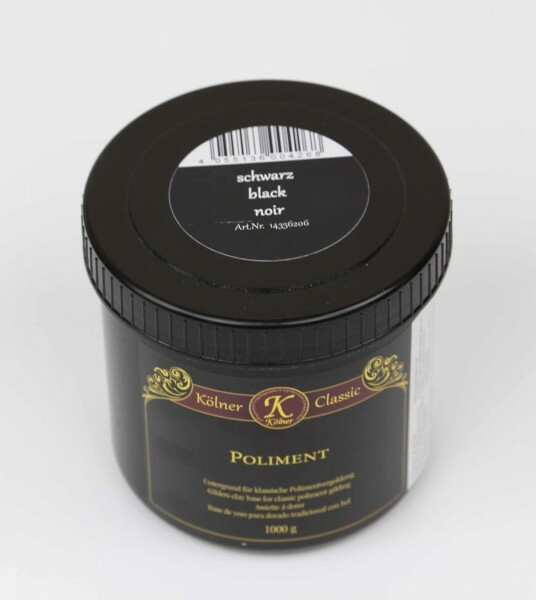 Poliment is also known as bole  a clay-like substance. It is applied to the prepared surface, usually gesso. Gesso is a mixture of chalk and glue. The gold is then applied. The poliment enhances the tone and lustre of the gold during the polishing/burnishing process. It is an unbound poliment (unprepared) and has to be prepared with skin glue, gelatine or egg white before application. Chemical description Dispersion in an aqueous solution. Customer evaluation for "Kölner Classic Poliment - Black"